A Florida college student accused of randomly killing a couple in their garage and chewing on the dead man's face told television psychologist Phil McGraw he was fleeing a demon-like figure named Daniel and only had a vague recollection of the slayings. A forensic psychologist says a former college student believed he was "half-dog, half-man" when he fatally attacked a man and woman at their home and was found biting one of their faces. Dr. Phillip Resnick made the conclusion in a 38-page mental-health report released by the Martin County State Attorney's Office, WPTV reports. Austin Harrouff is accused of killing Michelle Mishcon and John Stevens in their garage and then also attacking their neighbor, Jeff Fisher, who tried to help them. Investigators say they found Harrouff, now 22, biting Stevens' face while making growling noises on Aug. 15, 2016. “The fact that Mr. Harrouff persisted in biting the male victim in the presence of police officers, in spite of threats of being shot, being tased and receiving multiple kicks to the head, suggests that Mr. Harrouff was actively psychotic,” Resnick wrote in his report. In his opinion, Resnick – hired by Harrouff's defense team – concluded that Harrouff suffered from “severe mental disease,” particularly bipolar disorder and acute manic episodes with psychotic features. To arrive at his conclusion, Resnick said he held a six-hour interview with Harrouff at the Martin County jail; interviewed his friends and family; analyzed a video interview Harrouff had with Dr. Phil; and reviewed his videos and online searches. 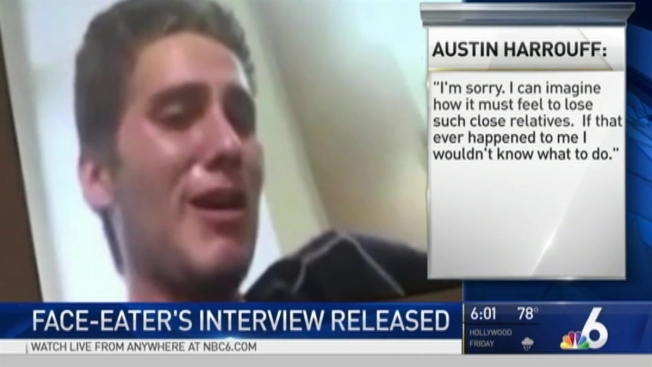 Harrouff began acting out of character and experienced elevated moods months before the attacks, according to Resnick. He became obsessed with having a rap music career, believed he was similar to Jesus and should be worshipped, and began walking in front of cars in streets because he felt invincible, Resnick said. The day before the attack, Harrouff thought he was a half-man, half-dog who could run "super fast," Resnick added. Harrouff's sister told Resnick that her brother wandered through bushes to be "one with the animals" and sat in the backseat of the car where the family dogs sat. Moments before attacking, Harrouff told Resnick he got scared after he saw someone who he thought was evil – a person who was actually a family friend. Harrouff said he then saw a light from Mishcon and Stevens' garage and ran toward it for help. Mishcon screamed. Harrouff thought she was a "witch" and attacked. When Stevens arrived to help, Harrouff got scared and attacked him. When Fisher arrived, he attacked him, too, according to Resnick's report. That day, Harrouff suffered from “clinical lycanthropy delusions,” Resnick said. While at the hospital, Harrouff made howling sounds and writhed in contortions, Resnick said, citing medical reports. Clinical lycanthropy is defined as a person's imagination of being transformed into an animal or being an animal. One 2004 study interpreted lycanthropy as a delusion related to self-identity disorder. "It is mainly found in affective and schizophrenic disorders but can be a symptom of other psychiatric disorders as well," the study concludes. "Psychodynamically this kind of delusion can be interpreted as an attempt to project suppressed affects, especially with aggressive or sexual content, into the figure of an animal."